Range balancing or "balancing your range" is a not an overly advanced concept by itself, but using it effectively at the tables does require some advanced skills. The idea of range balancing is only going to be effective about good players that think on at least level 2 (see multiple level thinking), so I probably wouldn't toy with the concept too much unless you're playing at $50NL or higher. 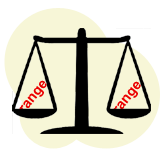 Range balancing is where you play the exact same way with a wide range of hands in certain situations. The most common example of range balancing is continuation betting. If you're continuation betting the flop 80% of the time or more, you're likely to be betting with a wide variety of hands ranging from air to strong made hands. Therefore every time you continuation bet, the range of hands that you could have at that point from your opponent's perspective is fairly well-"balanced". For more information on hand ranges, see the range article from the REM process section. If you only play certain strength hands in one way in a specific situation, your range is "unbalanced" to that certain range of hands. If you play a variety of strength hands in the same way in the same situation, your range will be "balanced" as your possible hand range is not weighted too far one way or the other. A balanced range makes it much more difficult for your opponent to take an educated guess at what you are likely to be holding. If you have a balanced range, your opponents are going to find it difficult to narrow your hand range down and play optimally against you. If we are making the same action with a variety of different hands, how can an opponent narrow down our range of possible hands? We benefit from the fact that our opponents can't narrow our range accurately based on our actions due to our "balanced range". The harder it is for our opponent to figure out what sort of hand we are holding the better. The less our opponent knows about our hand the more mistakes they will make when they play against us, which means that as a result we will be winning more money from them over the long run because they fail to play optimally. Unbalanced range - easy to play against. Balanced range - hard to play against. Example of why you should balance your range. Let's say that every time you flop a strong drawing hand like this out of position you check-raise your opponent on the flop. Against a bad player that takes no real notice of how you play your hands, you could check-raise drawing hands in this spot all day and make a healthy profit from it. However, an observant player will find out what you are doing sooner or later and start 3-betting back at you with top-pair hands, giving you bad odds to play on and forcing you to fold. Balance your range to make it difficult for your opponent to play against you. So as you can see, whilst you think the play itself might be pretty deceptive, it's actually not deceptive at all if we're doing the exact same thing every time against a "thinking" player. Our opponent will spot that our range is very unbalanced and weighted toward drawing hands when we do this and so can play accordingly to exploit our actions. Therefore, if we included other strengths of hands such as strong top-pair or better hands and complete air (preferably with some equity), our range would be more balanced. If our opponent is aware of how varied our range is when we check-raise in this spot it makes it difficult for them to choose the most appropriate action to take against us. At the end of the day, if you're not check-raising with a genuinely strong hand in this situation every now and then you are doing yourself an injustice by reducing the deceptiveness (and thus profitability) of your play. How to balance your range. Play different strength hands in the same way. Play the same strength hand in a different way. However, the tricky part to range balancing is not knowing the basics of "how" to balance your range, but more "when" to do so. After all, it's not going to be enough to bluff once where you would normally bet for good value. Balancing your range is a skill that you perfect with practice and a sound knowledge of your opponents. So I guess that means you'll just have to think about this concept a little more during play and get out there and start practicing. Be sure to remember that against bad players you should never concern yourself with range balancing. If some players are always folding to my semi-bluffs and bluffs when I check raise then I'm just going to continue doing so and forget about check-raising with strong hands. If they don't care about my range, then neither do I. Guide to balancing your range. Always be aware of the way you are playing your hand and how your opponent is reading in to your actions. Is it blindingly obvious that you are playing your hand like a middle pair that cannot take much action? Could your opponent ever put you on a strong made-hand when you're running that bluff on the river? Can you possibly hold anything other than the nuts in some situations? The key to understanding (and taking advantage of) range balancing is to look at your own plays and see how diverse your range could possibly be in each hand. If you ever feel that you range is too weighted to a certain set of hands in a particular situation you are probably making it easy for your opponents to play against you. I've pretty much covered all that I wanted to talk about when it comes to balancing your range in Texas Hold'em, although the guide to range balancing section at the end was a little thin. This has been more of an introduction to the concept than anything though. All in all, range balancing is definitely something that you should think about more as you move up the levels and find yourself playing against opponents that are good at reading your hand based on the way you play. The less your opponent knows about your had, the more mistakes they will make and the more bb/100 we can add to our win rate at the end of the day.